The 'Hymek' class were unique by the fact that they were the only Type 3 diesel-hydraulics to be built as this design was not part of the Modernisation Plan for Britain's railways. Beyer Peacock were hoping for a share of the diesel orders then being placed for Britain's railways and were in fact building shunting locomotives plus 200 sets of underframes for the Brush Type 2 locomotives. With an intention of supplying complete locomotives for future orders, Beyer Peacock looked into the possibility of building main-line diesel-hydraulics, and although BR employed Type 2 D6300 class and Type 4 Warship class, no plans were announced for a Type 3 machine of 1501 to 1750 hp. In response, Beyer Peacock formed a consortium in 1958 with Bristol Siddeley Engines and J. Stone of Deptford, named Beyer Peacock (Hymek) Limited. Their design for a Type 3 locomotive featured a 16-cylinder Maybach MD870 engine capable of 1,920 hp, coupled with the Mekydro K184U transmission. Construction was to based at Beyer Peacock's Gorton works in Manchester. In June 1959, the BTC ordered an initial batch of 45 'Hymeks' at a cost of £80,000 each, but in July 1960, ten months before the first 'Hymek' entered traffic, the BTC ordered a further 50 locomotives, such was the confidence in the design. A final batch of 6 locomotives was ordered in December 1961. The Maybach MD870 engine was basically a stretched version of the MD655 engine to be used in the 'Western' class, but with four intercoolers and two turbochargers. Power was reduced to 1,740 hp at 1500 rev/min to bring it in line with the Type 3 specification. Manufacture of the engine was to be at Bristol Siddeley's engine plant at Ansty, near Coventry although the first 20 units contained a number of parts from Germany. Similarly, of the 116 sets of Mekydro transmissions, 91 were made by J. Stone with the remaining 25 built in Friedrichshafen. The stretched-skin type of body construction so successfully used by the 'Warship' and 'Western' classes was not required for the 'Hymeks'. With conventional construction and, of course, a single engine and transmission, an adhesion weight of 75 tons was perfectly satisfactory. In addition, the absence of special construction methods removed the need for training of Beyer Peacocks workforce as well as entering into a licencing agreement with the Germans. The main load-bearing members of the 'Hymek' underframes were longitudinal rolled steel joists to which lighter angle sections were added to form the body framing. The body panels themselves were made from lightweight sheets as they were non-loadbearing as shown by the use of fibreglass mouldings for the cab roof. The bogie used on the 'Hymeks' was the tried and trusted Commonwealth design, to which, wheels of 45 inches diameter were fitted. This was an odd size for the Western Region as previous diesel-hydraulic locomotives used wheels of 39½ or 43 inches diameter . The first 'Hymek', number D7000, was handed over to the Western Region on the 16th May 1961 in a ceremony at Paddington station, almost two months ahead of schedule, however, the last 'Hymek' number D7100 was held up until February 1964, after problems at Gorton caused a delay in delivery for almost twelve months. 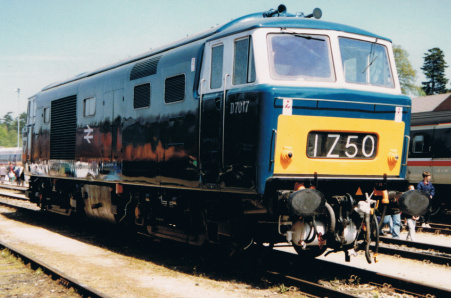 There were two main differences between the first and last members of the class in that D7000 to D7044 were fitted with the Stone-Vapor train heating boiler and brakes were of the Knorr straight air type together with Laycock-Knorr compressors. Numbers D7045 to D7100 used the Spanner Mk. IIIa train heating boiler and brakes and compressors were supplied by Westinghouse. The location of the air horns on the first three members, which was under the buffer beam, was moved to the cab roof on the remainder of the class and those first members had their horns repositioned to the cab roof also. Livery on all members of the class when delivered was Brunswick Green with a light green band band running the full length of the locomotive at waist height. In addition, the window surrounds were painted white. The running numbers were an unusual feature of the class in that the cabside numbers where made from cast aluminium. The 'Hymeks' did not receive the "TOPS" style of numbering which would have been 'Class 35'. The first problems to befall the class arrived at the end of 1961. The engine coolant temperatures were found to be too excessive in addition to the more serious problem of transmissions failing on starting. The Western Region was obviously concerned with this latter fault, and to isolate the cause, the class were split into two groups. The odd numbered locomotives up to number D7075 had the engine derated to 1,350 hp whereas the even numbered members up to number D7078 had the first gear locked out of use. After much investigation it was found that there was a weakness in the transmission control gear not changing gear at the preset engine speeds, which in turn caused them to overheat. A strengthened control gear was found to be sufficient and all of the 'Hymeks' reverted back to normal condition by the end of 1963. The Maybach MD870 engine generally have good performance and reliability with occasional engines loosing coolant into the cylinders. By the 1970s, the engines regularly completed 8,000 to 10,000 hours service between overhauls. The Mekydro transmission, however, was prone to several faults including converter failure, damage to the clutches, stripped gear teeth and metal in the filters. The rate of failed transmissions got so bad that spare units were constantly in short supply and to keep some members of the class in service, transmissions had to be borrowed from other 'Hymeks'. However, following a period when the 'Hymeks' were given relatively easy workloads and schedules, the class turned in probably the best performance of all the diesel-hydraulics. The first 'Hymeks' to be withdrawn were numbers D7006 and D7081 in September 1971. A additional 78 members were withdrawn by the end of 1972 leaving just 21 examples, 14 at Old Oak Common and 7 at Bristol Bath Road to face a bleak future. However, by the end of 1973, ten survivors were still in service due to the 'Hymeks' replacement locomotive, the Brush Type 2 (Class 31), initially suffering twice the failure rate of the 'Hymeks'. British Railways organised a 'Hymek Swansong' tour on the 22nd of September 1973, hauled by D7001 and D7028. While the pair were waiting at Didcot, number D7026 ran through with an Oxford express as if to show that the class were far from finished. And so it turned out that way, as just four 'Hymeks' were withdrawn during 1974 leaving D7011/17/18/22/28 and 29 in service towards 1975. However the 'Hymek' survival could not last forever and in January 1975 D7028 was withdrawn, followed by D7029 in February and the last four in March. Many people regretted the passing of the 'Hymeks' as they were probably the most reliable and successful of all the diesel-hydraulics. Their downfall was the lack of standardisation of parts with other locomotive classes together with the shortage of spare parts which led to the cannibalisation of the withdrawn examples to keep the few remaining locomotives in traffic, a situation not helped by the closure of Beyer Peacock in July 1966. Four 'Hymek' locomotives escaped the cutter's torch and they are numbers D7017, D7018 D7029 and D7076.